Have you read her book? I have seen it around but haven’t read it- I should. Taylor Swift- The Taylor Swift interviewing Pattie Boyd?…. What Beatles wife was the first to have a song written for her?- my trivia question of the day..
You got me on that one! Which one and what song? My guess is Cynthia. At her fathers request- Jack Lawrence wrote a song for her called Linda- when Linda Eastman as four years old. .. will have to read the Pattie book just because- it’s a Beatles book. Of course got to read Sir George books first. that would be an interesting book…I’ll add that one to my list! I’ve often thought , wow,there must be something , some intangible quality about Patti. she is, or at least was, a very attractive young woman, no question, but those guys were surrounded by thousands of those. For her to inspire such passion and crazed desire… she must’ve been “Something”! 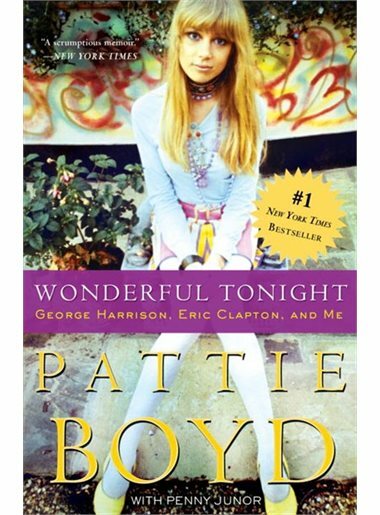 I think I’ll read Patti’s autobiography. For some reason it hadn’t been high on my list. I never knew about the interview Taylor Swift did. That’s really cool. I’ll be reading that, too. Thanks that is great! One request… when I die can I come back as a 60s – 70s British pop star?